Leave head and fit intact. Wash thoroughly. 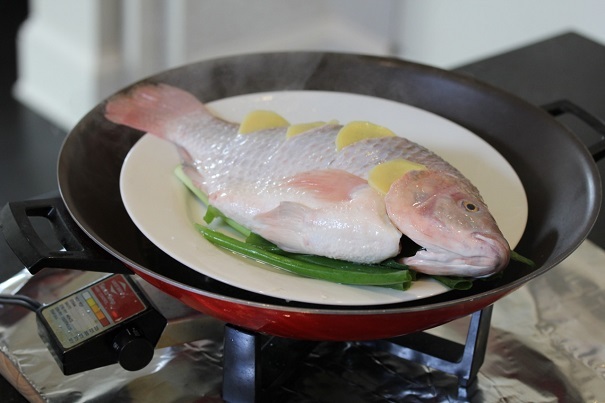 Place the diced scallions at the bottom of a heatproof plate large enough to hold the fish. Put the fish on the plate and top with half of the julienned ginger. 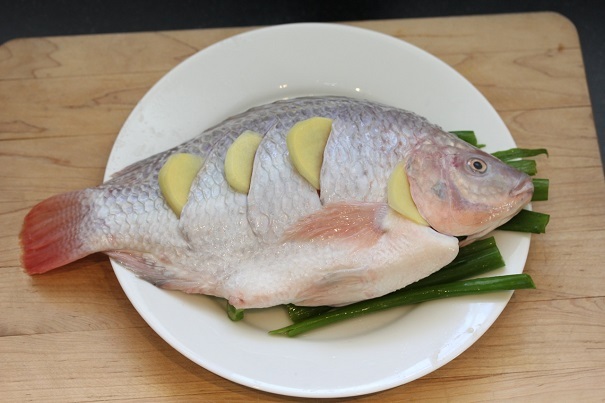 Place the plate with the fish inside a steamer or a large roasting pan with one inch of water. Steam for 20 minutes or until fish is tender and fully cooked. Cover fish with wet paper towel and cook on high power for 12 minutes. Remove fish from steamer and top with the rest of the julienned ginger, scallions and cilantro. Heat oil in a heavy saucepan until smoky. Pour hot oil over the fish.